Association President Ralph White, without opposition, has been elected to a fifth three-year term on the State Retirement Board. â€œWhen the deadline for filing nomination papers came and there were no other candidates it was a surprise to me,â€ said White. â€œIn the years that Iâ€™ve been on either the PRIM or State Board Iâ€™ve always had election opposition. However, I donâ€™t regard this (election) as a so-called â€œfree ride.â€ There are no free rides in this business. The challenge for improvement still exists. Public Sector Protesters in Wisconsin Face a Backlash, But Are State Workers Really Overpaid? Are public workers overpaid? Are their entitlements too cushy, their retirements too rich? How do they compare in overall compensation with their private sector peers? February 4, 2011: Senate President Therese Murray and House Speaker Robert DeLeo have each shuffled the deck with a realignment of their respective leadership teams for the new 2011-2012 Legislative Session. Of direct importance to public retirees are the Joint Committee on Public Service, as well as the respective House and Senate Ways and Means Committees. ELECTION DAY 2010: With Election Day, November 2, now less than a month away, Association leaders continue to stump for candidates approved and endorsed by our Executive Board. Our Association has a long history of actively endorsing those candidates who, regardless of party affiliation, have a record of supporting public retirees. We especially look toward candidates who have played an active role in sponsoring our Association's legislation and impacting public policies that are favorable to public retirees. NOVEMBER 2010 VOICE: When Senator Mike Morrissey announced his candidacy for District Attorney of Norfolk County, two strong candidates within his district announced their candidacy in the Democratic Primary to succeed him. State Representative Steve Tobin of Quincy and Quincy City Councillor John Keenan both filed nomination papers for Morrissey's seat which will be vacated in January - the Norfolk and Plymouth District. 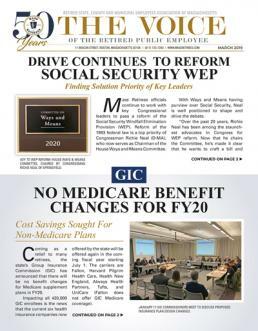 NOVEMBER 2010 VOICE: In the first of a three-part series that examines the issues surrounding Social Security, we will begin by exploring the basic Social Security program itself. Part II will explain the WEP/GPO, while Part III will look at the various proposals for reforming the program. NOVEMBER 2010 VOICE: Another election cycle brings with it the latest attempt by anti-government groups to cut or eliminate certain Massachusetts taxes. This year their focus is cutting the sales tax to 3%, while also eliminating the sales tax on alcohol. 2007 JULY - Rubin Had Been Deputy Treasurer - Shortly after going to press with the May edition of the Voice, Governor Deval Patrick shuffled the deck in his inner circle by replacing Joan Wallace-Benjamin with Doug Rubin as his chief of staff. Rubin, who had been the new governor’s top political advisor during the 2006 campaign, previously served as the state’s first deputy treasurer from 2003-2006. As the first assistant to Treasurer Tim Cahill, Rubin worked closely with the Pension Reserves Investment Management (PRIM) Board and the State Retirement Board.